Restore the beauty of your outdoor space. When it’s been a while since your business’ exterior received some professional help, rely on the team at CGS to have your property looking immaculate with our clean up services. Keeping your outdoor area looking neat and tidy can seem like a costly and time-consuming exercise for business-owners, especially those managing large retail or commercial facilities. Our team makes it easy, offering professional clean up services to suit every budget and every property. To make our garden clean up costs manageable, we can quote to a budget or provide staff for a set number of hours, ensuring you know exactly how much you’ll be paying. Ensure that you’re giving your property the care it needs without excessive expenditure with help from CGS. Choosing to invest in regular clean up services for your outdoor area can offer your business numerous benefits. Not only will you be able to offer a better experience to guests and stakeholders who may otherwise become frustrated with an overgrown or untidy outdoor area, you’ll be able to improve access to your whole property. 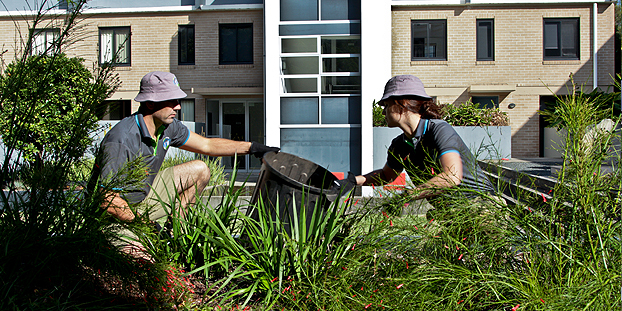 CGS offers a full suite of services as part of our clean up packages, including trimming and shaping of trees and shrubs, hand weeding of garden beds and a complete tidy up after the project including removal of green waste, leaving your space looking spotless. With more than 25 years of experience in the industry, you can count on CGS to deliver a superior service every time. We understand the importance of professionalism and safety, ensuring full compliance with all occupational health and safety standards throughout all projects. Make the responsible choice and talk to CGS about how we could help your business. Call the Sydney team at CGS on 1300 661 182 or send us an email with your questions at chris@cgsfm.com.au and our team will be happy to help you develop a clean-up program that suits you.